The company lost €916 million during its fiscal year to March, and expects to lose €356 million net loss over the next twelve months. STRUGGLING ELECTRONICS GIANT Sony lost €916 million in the fiscal year to March, the once-mighty firm said Wednesday, blaming costs tied to its exit from the personal computer business as it undergoes a painful restructuring. The Japanese firm booked a whopping shortfall of 128.37 billion yen (€916 million), and forecast a 50 billion yen (€356 million) net loss in the current fiscal year to March 2015, as it saw losses narrow in its hard-hit television business. Revenue increased 14.3 per cent to 7.76 trillion yen owing to a weak yen, record sales for its new PlayStation 4 (PS4) videogames console and strong demand for its smartphones. The company’s woeful bottom line results come a day after it said it would not pay bonuses to senior executives for the third straight year. 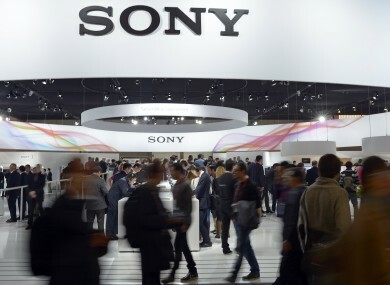 Moody’s has downgraded its credit rating on Sony to junk, saying the company must do more to repair its battered balance sheet. Investors were shocked this month when Sony warned it would lose more than the 110 billion yen shortfall it had forecast just three months ago, when it said it would cut 5,000 jobs in its struggling computer and television units. Sony President Kazuo Hirai has led a sweeping restructuring, including asset liquidisation that saw the €728 million sale of Sony’s Manhattan headquarters. Last week, Sony said it would shutter its ebook Reader Store in Europe and Australia following a similar pullout in North America. Reports have also said Sony would sell properties at a prestigious Tokyo site where it had its headquarters for six decades. But Hirai has repeatedly shrugged off pleas to abandon the ailing television unit, which he insists remains central to Sony’s core business. Japanese manufacturers have suffered badly in their TV divisions as razor-thin margins and fierce overseas competition weigh on results. But the company that revolutionised the way people listen to music with its Walkman portable cassette player has lost its footing since the sure-fire successes of the 1980s, and been overtaken by nimbler foreign competitors like Apple and Samsung. The electronics that built the brand are now an albatross around its neck, weighing on the profits that other arms of the huge company generate, such as those in music publishing and a movie division that includes a Hollywood studio. But the movie business also struggled over the past year, while the cost of the PS4 launch put its games division into an operating loss, Sony said. “Sales for Motion Pictures decreased significantly year-on-year due to lower theatrical and home entertainment revenues as the previous fiscal year benefitted from the strong performances of Skyfall, The Amazing Spider-Man and Men in Black 3,” Sony said in a statement. Earlier this year, Sony said it was selling its Vaio-brand PC division to a Japanese investment fund as it plans to concentrate on its line-up of smartphones and tablets. After suffering four years of losses, Sony crept back into the black in the previous fiscal year – although that was mostly due to asset sales and a weak yen which inflates repatriated profits. Despite its high-profile struggles, Sony has seen buoyant sales of its Xperia smartphone offering and record demand for its new PlayStation 4 console. Last month, the firm said it had sold seven million PS4 consoles worldwide since its launch in late 2013. The PS4 is up against Microsoft’s Xbox One, and Nintendo’s Wii U for dominance of the digital home entertainment market at a time when consoles are under intense pressure to prove their worth in a world of ubiquitous smartphones and tablets for games and videos. Sony’s Tokyo-listed shares closed up 1.06 per cent to 1,805 yen, with the earnings announcement made after markets had closed. Email “Strong PS4 and smartphone sales not enough to keep Sony out of the red”. Feedback on “Strong PS4 and smartphone sales not enough to keep Sony out of the red”.